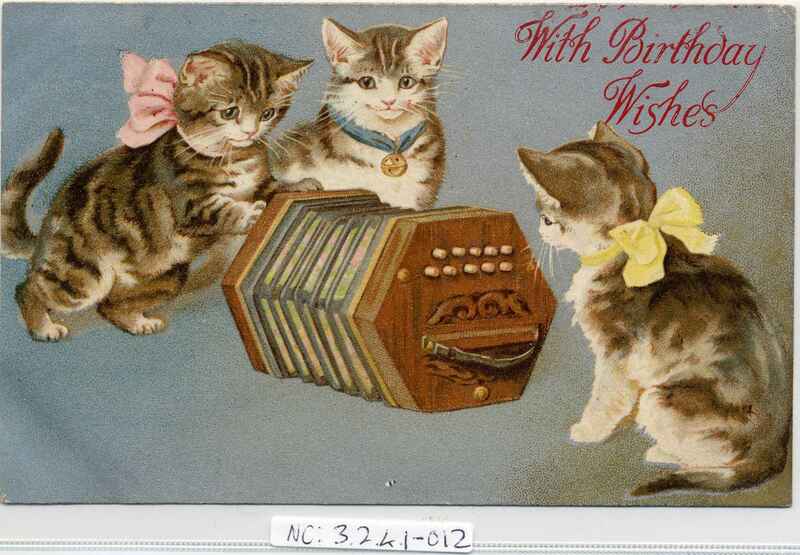 Full Description: One of the many variant postcards of the "Three Kittens plus Anglo Concertina" card that appear from various countries, and are used for various events and for various greetings cards, in this section used as Birthday Greetings post cards. Both cats and concertina are particularly realistic, and the image and its variants were copied and adapted all over Europe. See also Items 3.2.2-008 to -015 for more general cards featuring these cats. This birthday variant has three kittens plus Anglo in colour on a silvered card, 'With Birthday Wishes' embossed. Labelled "Wildt and Kray London EC Series 534". Divided rear 'Printed in Germany'. See also Items 3.2.4.1-001, -002 and -003. Postally used, divided rear, franked 1906.